For the Month of January, we will be having a Check-in Contest!! 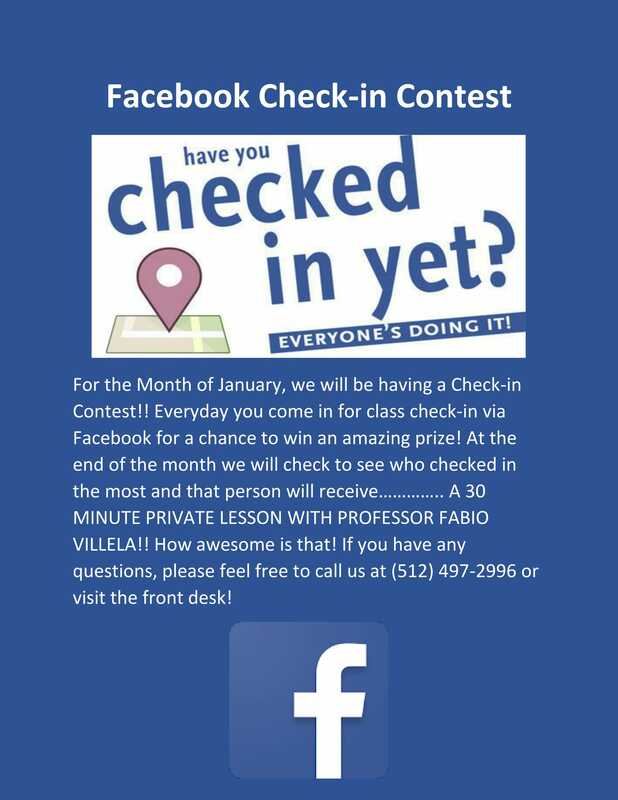 Everyday you come in for class check-in via Facebook for a chance to win an amazing prize! At the end of the month we will check to see who checked in the most and that person will receive………….. A 30 MINUTE PRIVATE LESSON WITH PROFESSOR FABIO VILLELA!! How awesome is that! If you have any questions, please feel free to call us at (512) 497-2996 or visit the front desk! We will teach your child to use verbal assertiveness to deter bullies and several non-violent self-defense techniques to stay safe if physically assaulted. Importantly, we don’t teach how to punch or kick, since this often does more harm than good. Instead, we use leverage-based control holds to neutralize threats without violence. 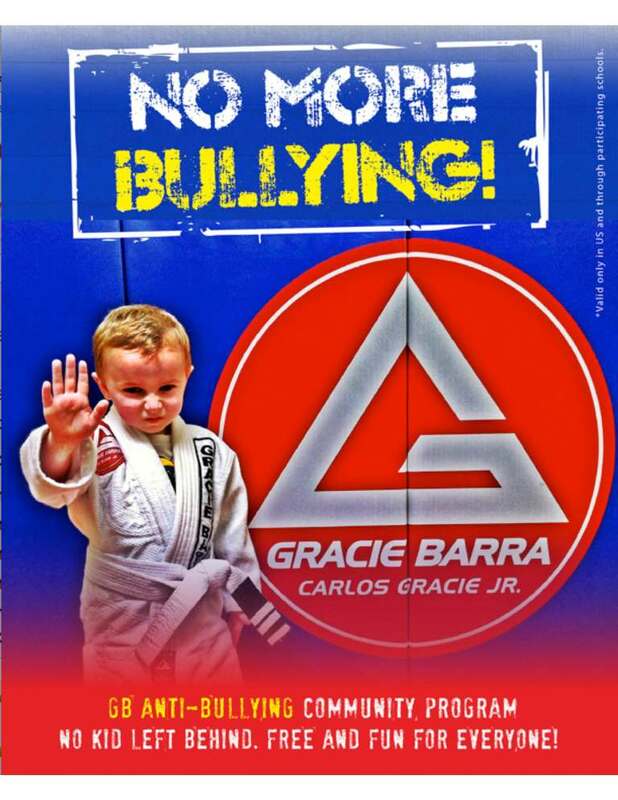 Numerous school districts have embraced the defensive nature of the Gracie Barra kids techniques as a reasonable, nonviolent response to bullying and some even host Gracie Barra Anti-Bully classes on campus! The bottom line is: we will prepare your child to defend themselves against bullies without turning them into one. 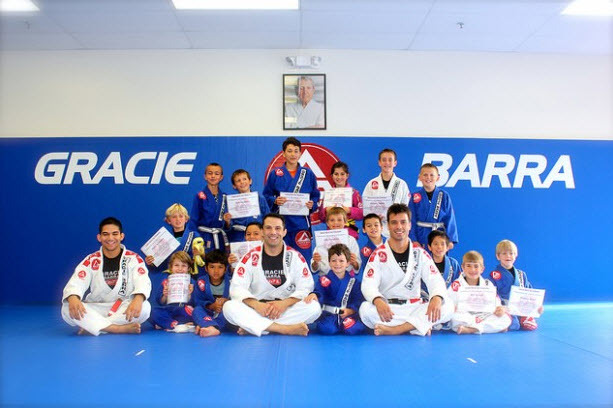 Important parts of the Gracie Barra school are the kid’s jiu-jitsu programs. Today’s children are faced with many challenges in life from bullying, to lack of proper role models to unhealthy lifestyle. Jiu-jitsu classes can be a way for parents to expose their children to an invaluable education (both physical and mental) that sets the basis for their personal growth as young people. This week we feature a 2 part interview with 2 Gracie Barra Black belt professors who run schools with successful children’s martial arts programs: Professor Fabio Villela and Professor Felipe Guedes share their knowledge and experience in running successful children’s jiu-jitsu classes. Q: Many parents are aware that enrolling their children in a martial arts program can help instill confidence, discipline, cooperation with others and respect in young people. What do you feel are the primary benefits for kids to be regularly attending jiu-jitsu classes? Prof. Fabio Villela: I believe it is discipline. Because they need it to develop Jiu-jitsu skills also build up stronger self-confidence. We as Jiu-jitsu instructors have the job to take them out of the comfort zone and everyday make them have a good challenges the kids can be proud of themselves. Their parents will see their evolution inside and outside the mats! 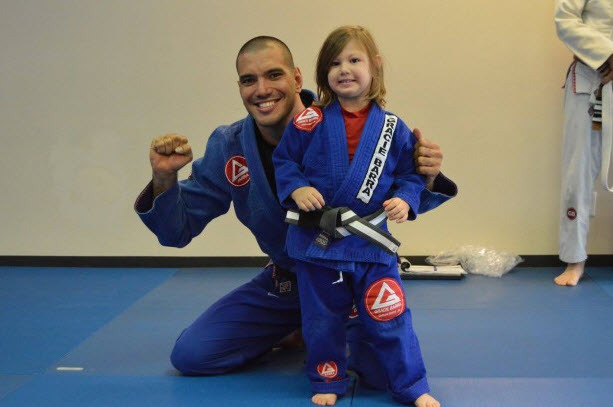 Prof. Felipe Guedes: I’ve been teaching martial arts for kids since 2008, to hundreds of families. And I’ve seeing Jiu jitsu helping their kids in so many ways! Every child is different and we use Jiu Jitsu to benefits each child the best way as possible. Some kids are in one side of the spectrum being very shy, for those the first benefits that the parents notice is the level of confidence becoming higher, they start to understand what they are capable of and not allowing anyone to take advantage of them and being comfortable on their own skin and even helping them to be more decisive and confident to make decisions. Their abilities to interact socially with other kids improve so much, and they are not afraid anymore of looking others in the eyes when having a conversation and having to even speak in public. Now to finish your question, commitment is a extremely important factor in martial arts, and one of the first things we learn as a student or either a parent, nothing happens over night, the day by day team work between parents and Coaches will have a positive impact into the future of our kids. And consistent training is irreplaceable, always not forcing, but reinforcing to our kids why is so important to train Jiu-Jitsu and how much they have improved, recognizing their hard work. This seems obvious, but I have to admit that today’s culture is a culture of instant gratification, where everyone wants things now, now, now! But only the ones that are willing to work hard with consistency will achieve the results. Q: What kinds of problems and stresses do some children face and how does jiu-jitsu help those children successfully deal with those challenges? Prof. Felipe Guedes: Growing up is a stressful process to anyone, elementary school, teenager years, etc… only after we pass that stage is that we come to realize that the problem we had weren’t that big and actually our next challenge is greater. In Jiu Jitsu the same thing happens, we started brand new, learning the basics, and then we start to move up in belts, every time we earn a new belt the cycle starts over again and the challenge is now greater. That process of moving up on belts emulates life, and gives the opportunity to our kids to embrace challenge instead of shying away from it. Empowering our kids to embrace challenge is one of the best things we could do as educators. Also, human beings are social creatures, and we all sick to fit or click with a group of people and have a sense of belonging. At Gracie Barra everyone is treated the same, with respect and into a environment of mutual support, where the primary mind set is how can we work together as a group to help each other to learn and improve technically and mentally. So the friendships that we build on the mats are strong and have a very special bond. Another very important practical aspect of our daily jiu-jitsu training that allows our kids to deal with stress is that Jiu-jitsu provides our students a perfectly safe environment to expose the kids to challenges, being on a bad position while sparring, and allowing them to exercise controlling and not panicking, in order to think and try to escape from a tough situation. By exposing the kids to this type of training allows them to develop the ability to solve complex problems under stress, and when they earn about this they become masters of themselves to deal with stressful situations out into the real world. Bullying is a very good example of that, one of the biggest sources of stress that our kids suffers these days. Jiu jitsu can put a end to this. Prof. Fabio Villela: For sure, self-confidence issues are the biggest problem for kids and this can develop speech and social problems. In Jiu-jitsu we always need to challenge ourselves training with somebody stronger, heavier, higher level and learn new techniques everyday. Whenever the kids find out they can do it, their self confidence will get stronger inside and outside the mats. Q: What kind of positive feedback have you heard from parents whose children have started jiu-jitsu? Prof. Fabio Villela: The 1st biggest change usually is at school and inside their homes. At school they get better grades, don’t get in trouble and be more respectful with teachers and friends. At home they listen more to their parents and are more respectful with siblings. Prof. Felipe Guedes: Fortunately many! And it varies a lot from age to age, the specifics of the feedback we hear from the parents are different when is a 4 years old or a teenager. respecting others, and even saying no to drugs for the teenagers! Click here to read more about Jiu Jitsu is Great For Kids.